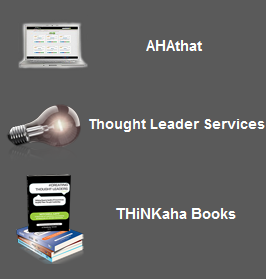 #CORPORATE CULTURE tweet Book01 | THiNKaha: Become a recognized expert in your field of expertise. Compelling thought leadership content. Section 1: What is Culture? Wally Bock (@wallybock) helps leaders at all levels do a better job and live a better life. Ted Coiné (@tedcoine) is a business heretic and (un)CEO at http://www.savvycapitalist.blogspot.com. Joan Koerber-Walker (@JKWleadership) is Founder and Chairman of CorePurpose, Inc. 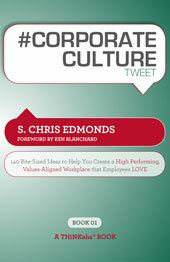 In #CORPORATE CULTURE tweet Book01, S. Chris Edmonds starts at the very beginning–by showing you how to recognize an organization’s culture and identify what a healthy workplace culture looks, acts, and sounds like. This may sound trivial, but it is not. Oftentimes, surface appearances are deceptive and you need to dig a little to learn the truth. An organization that appears healthy and happy may have large numbers of low-productivity, demotivated employees. Conversely an organization that appears to have plateaued or be driven by a handful of strong personalities may, counter to intuition, boast of stellar performers and consistently upbeat results. Having shown you how to recognize a healthy organization, the author uncovers the power of ‘boss behavior.’ Most of us remember our best boss ever, a person who created a work environment that enabled us to perform at our best while being incredibly satisfied with our boss, team, and work. Chris describes how great bosses behave to ensure that organizational culture standards are maintained and reinforced each day. Just as culture change is hard for individuals, it is difficult for organizations. It takes discipline and effort to focus on culture management day in and day out. Which is why Chris also engages us on accountability behaviors and actions that ensure that the desired organizational culture is embedded and acted upon. Written in the actionable tweet format and demonstrating the value that can be delivered in small packages,#CORPORATE CULTURE tweet Book01 will find a home on every progressive corporate leader’s bookshelf. #15 Leaders can measure team members and team performance when clear goals exist. Without those, it is difficult for teams to gauge success. #36 Rise above the temptation to focus solely on performance! What values are acted on in your company today? Are those the values you want? #71 Great bosses don’t need an “open door policy.” They manage by wandering around, engaging staff every day. #125 Leaders, are you measuring, monitoring, and rewarding the right things in your company? Strategize what you need and reward those things. 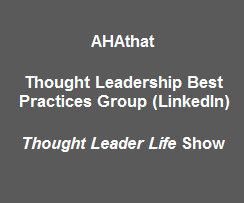 #CORPORATE CULTURE tweet Book01 is part of the THiNKaha series whose 100-page books contain 140 well-thought-out quotes (tweets/ahas). Dan Rockwell (@leadershipfreak) is a community leader and consistent #leadership Top Tweeter. S. Chris Edmonds is a speaker, author, and senior consultant with the Ken Blanchard Companies. He has co-authored Blanchard’s bestselling book, Leading at A Higher Level, and award-winning culture change process. As Blanchard’s culture expert, he has helped numerous clients create a high performing, values-aligned culture using their proven process. Chris’ blog at DrivingResultsThroughCulture.com and his tweets (@scedmonds) have resulted in thousands of followers on Twitter, Facebook, and LinkedIn who look forward to his culture tweets each day.